Despite the financial crisis, economic sanctions and technological difficulties, the Russian Federation is modernizing the Armed Forces within the framework of the State Armaments Program 2011-2020 (Rus. GPW 2020). The modernization of the strategic nuclear forces is considered in Russia as one of the priorities, since the nuclear forces determine Kremlin’s prestige and the position as a superpower. Currently, the nuclear war seems to be a strictly theoretical problem, particularly as far as strategic nuclear strikes are concerned. However, Russia perceives nuclear weapons as a political tool, which may be used against other countries. On December 26, 2014, President Putin approved the new ‘Military Doctrine of the Russian Federation’, which states that “the Russian Federation shall reserve the right to use nuclear weapons in response to the use of nuclear and other types of weapons of mass destruction against it and/or its allies, as well as in the event of aggression against the Russian Federation with the use of conventional weapons when the very existence of the state is in jeopardy”. This article indicates that Russia is determined to defend its territory using the entire military power against an enemy. Given Russia’s policy towards Ukraine, the nuclear weapons are highly efficient to exert political pressure on other countries and, in turn, secure the Russian Federation from an open military conflict. As far as military objectives are concerned, strategic nuclear weapons are currently of secondary importance. Given a hypothetical conflict with NATO, Russia could use its strategic nuclear warheads only as a weapon of last resort. According to the nuclear doctrine of mutually assured destruction (MAD), the United States and Russia posses enough nuclear weaponry to destroy each other. Since the 1990s, the maintenance cost of nuclear weapons has become an important issue for both Russia and the United States of America. The reduction of the American nuclear arsenal began in the 1960s. However, the Soviet Union decided to reduce the total number of its nuclear warheads in the late 1980s. Over the last few years, Russia has approved the reduction of the strategic nuclear weaponry, nevertheless, the negotiations with the United States has not considered the tactical nuclear weapons. All American-Russian talks and subsequent treaties (START-I, START-II, SORT, and NEW START) were limited to negotiations concerning the number of strategic warheads, intercontinental ballistic missiles, submarine-launched ballistic missiles and strategic bombers. Russians have refused to discuss the number of tactical warheads, which are of much greater importance for Kremlin’s military strategy. The Russian Federation does not possess enough conventional armaments to balance the military power of NATO or China. Furthermore, it is worth mentioning Russia’s economy and demographics, which are not equal to the North Atlantic Alliance or People’s Republic of China. Given the Zapad-2009 military exercises when the Russian Armed Forces were probably simulating a nuclear attack on Warsaw, Russia is certainly considering regional conflict scenarios in which tactical nuclear warheads might be used. Despite Russia’ efforts in the field of information warfare, the North Atlantic Alliance has limited nuclear weapons capabilities in Europe. Besides the United States, the only NATO members that possess nuclear warheads are France and the United Kingdom (over 500 warheads in total). In accordance with the NATO nuclear sharing policy, there are approximately 200 B-61 tactical nuclear bombs deployed in Belgian, German, Dutch, Italian and Turkish air bases, which remain under control and custody of the United States. However, it is worth emphasising that NATO’s stockpile of nuclear weapons in Europe is much lower in comparison to Russia’s nuclear arsenal. Russia’s nuclear triad is composed of the Strategic Rocket Forces, equipped with intercontinental ballistic missiles (ICBM); Long Range Aviation (a branch of Russia’s Aerospace Forces); and nuclear-powered ballistic missile submarines (the Navy). The main challenge for the Strategic Rocket Forces is to replace soviet ballistic missiles from the 1970s: silo-launched RS-18 ICBMs (NATO: SS-19 Stiletto), RS-20 (NATO: SS-18 Satan, its currently operational version has been introduced in 1988 and is also known as R-36M2 Voyevoda) and RS-12M Topol mobile launchers (NATO: SS-25 Sickle). 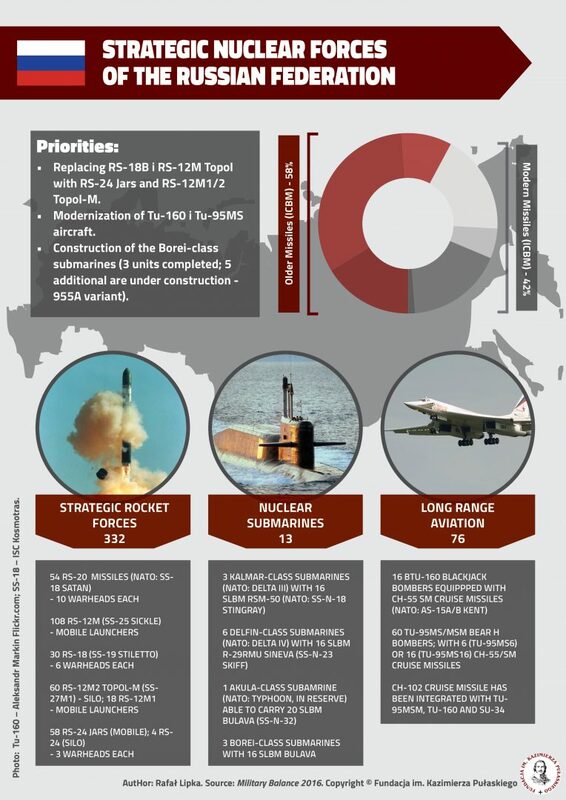 These systems are being systematically replaced by RS-12M1/2 and RS-24 Yars ballistic missiles. In February 2017, the Ministry of Defence of the Russian Federation announced that 41 modern ballistic missiles had been delivered and, in turn, the percentage share of the modernized equipment of the nuclear triad has reached 60 percent. However, the Ministry of Defence did not specify the number and type of the systems which were delivered to the Armed Forces. According to the Military Balance 2016 approximately 42 percent of the equipment of Strategic Rocket Forces can be perceived as modern, however, other reports from 2016 suggest that the percentage share of the modern equipment is about 50 percent. This phenomenon can be explained by the fact that Russians do not only modernize the Strategic Rocket Forces but also reduce the total number of the deployed missile systems. According to the press releases published in 2016, Russians are developing RS-28 Sarmat system, which is a heavy strategic ballistic missile of the new generation supposed to replace RS-20 (RS-36M2 Voyevoda) missiles. The RS-28 Sarmat will be probably equipped with 16 nuclear warheads and also the JU-74 hypersonic missile. The latter one is expected to be capable to overcome the advanced missile defence systems. Currently, it is impossible to verify whether the information concerning the RS-28 missiles are true. It is worth noting that the capabilities of this system may be greatly exaggerated and turned into Russia’s propaganda tool and part of information warfare. It is also worth emphasizing the growing strategic potential of Russia’s Navy. In recent years, three Borei-class nuclear-powered ballistic missile submarines (Project 955) have been commissioned and five additional 955A submarines are under construction. Currently, Russia has 12 ballistic missile submarines, which represent three different types (one Akula-class submarine is in reserve). There is no denying that the Delta III-class submarines, which were developed in the 1970s, should be replaced immediately. In 2017, the Russian Navy is expected to launch an additional Borei-class submarine in its modernized 955A version. The new generation of the nuclear-powered submarines is equipped with 16 Bulava ballistic missiles, each of them with 6 nuclear warheads. However, the Bulava missile still requires further improvements. The missile failed in 8 out of 26 launch tests that were conducted by the end of 2016. Russia’s Long Range Aviation is relatively in the worst condition, since it will be necessary to replace Tu-160 and Tu-95 aircraft in the coming years. Russia is modernizing its strategic bomber fleet while waiting for a stealth bomber of the next generation. The Tupolev Design Bureau is currently developing the PAK-DA project (Rus. Перспективный авиационный комплекс дальней авиации). According to the press release published by ‘Sputnik’ agency on March 2, 2017, the company has built the first model of the aircraft in 1:1 scale. Furthermore, according to the Russian news agency, the first flight of the prototype is expected in 2021. However, given the problems encountered by the fifth generation Sukhoi T-50 fighter (PAK-FA, Rus. Перспективный авиационный комплекс фронтовой авиации) as well as a decision to resume production of the Tu-160 bomber (M2 variant), it seems doubtful whether the Russian industry is ready to begin full-scale production of the next-generation bombers by 2025. There is no denying that the Tu-160 and Tu-95 aircraft are still a lethal weapon due to their armament, particularly the Kh-55 and Kh-102 cruise missiles with nuclear warheads. The estimated range of relatively modern Kh-102 missiles is about 3,000–4,500 km. Despite the fact that the reduction of strategic nuclear forces has been negotiated between the United States of America and the Soviet Union (and subsequently Russia), the inventory of tactical nuclear weapons of the latter one seems to be a far greater threat as far as military factors are concerned. 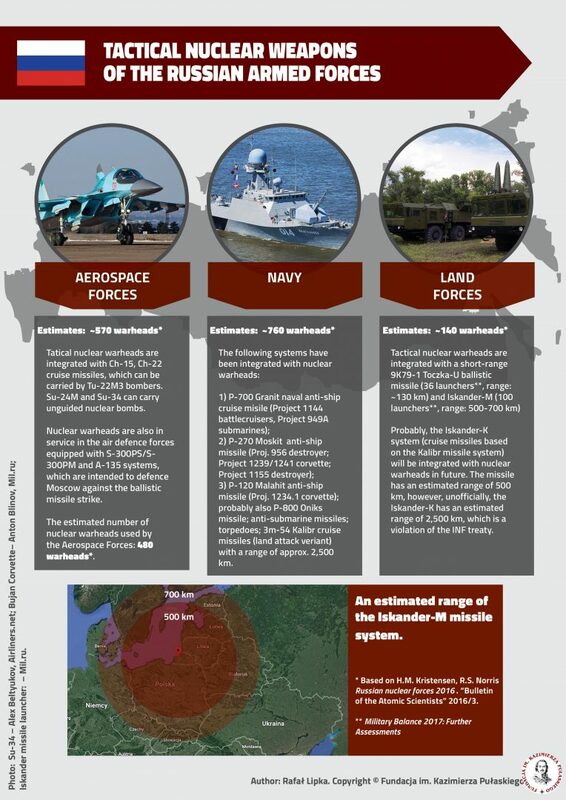 The estimated number of Russian tactical warheads varies between reports. 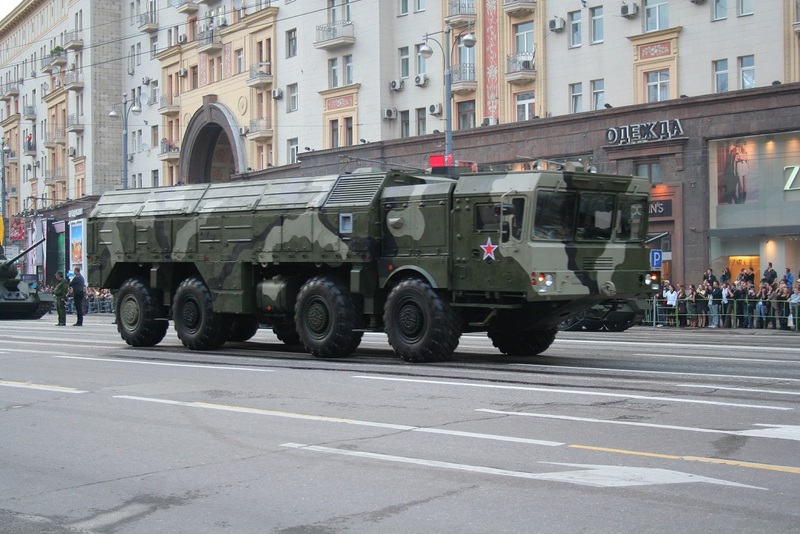 According to the Military Balance 2016, Russia has about 2,000 tactical nuclear warheads in service, however, it does not change the fact that Russia’s nuclear stockpile is still several times higher than NATO’s nuclear arsenal in Europe (including B-61 bombs deployed in Europe in accordance with the Nuclear sharing policy, as well as French and British stockpiles). 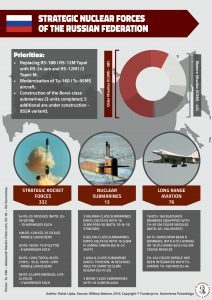 It is worth noting that tactical nuclear warheads are used by Russia’s Aerospace Forces, Land Forces and the Navy (infographic 1). There is no doubt that Russia has a wide range of systems that are capable to carry tactical nuclear warheads. Given the limitations of Russian military industry, which is supposed to face the requirements of the State Armaments Program 2011-2020 and other issues related to economic sanctions, it is worth emphasizing that the tactical warheads are perceived by the Kremlin as a necessity. 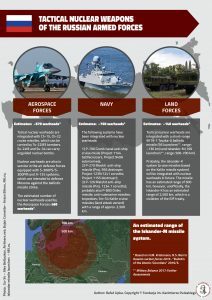 Russians are aware of the technological advantage of the West and the fact that Russia’s Armed Forces are not able to compete with NATO as far as conventional weapons are concerned. Furthermore, it is worth noting that Russians use the nuclear systems for propaganda purposes. There is no doubt that the Iskander-M system has become the most discussed ballistic missile by the media. So far Kremlin’s policy has been based on threatening Poland and the Baltic states. Consequently, the Iskander system has been extensively used as a tool to undermine the unity of the North Atlantic Alliance. The war in Donbass is an evidence that Poland’s and Baltic states’ concerns are justified. However, the deployment of the Iskander missile system in Kaliningrad Oblast should not be perceived as the serious threat. Russians are capable to deploy their missiles in Kaliningrad within several dozen hours and it is just a matter of political decisions. On the other hand, the modernization of the Strategic Rocket Forces poses a serious threat to NATO. Therefore, the European NATO members ought to increase their spending on the modernization of the air defence systems, particularly against the ballistic and cruise missiles. Given the possibility of replacing the conventional warheads with nuclear weapons, the tactical nuclear weapons can be perceived as an excellent political tool, which is extensively used by the Kremlin. 1. The modernization of the strategic nuclear forces is one of the priorities for Russia’s defence industry. Despite economic difficulties, Russians are modernizing all branches of the Armed Forces and increasing their capabilities in terms of nuclear weapons. The risk of nuclear conflict remains hypothetical, however, it cannot be entirely excluded. Modern strategic and tactical nuclear weapons are also intended to strengthen Russia’s position in global politics. 2. Currently, strategic nuclear forces are of secondary importance as far as the military is on a battlefield. Russia’s Military Doctrine suggests that the use of nuclear weapons in an armed conflict is possible. The modernization of Russia’s ballistic and cruise missiles poses an issue that requires development of multi-level air defence, which will be capable to counter a wide range of air and missile threats. 3. In the near future, it is highly unlikely that the United States Armed Forces will withdraw the B-61 nuclear bombs from Europe due to ongoing nuclear weapons modernization and growing tensions between NATO and Russia. Furthermore, it is also worth emphasizing that Donald Trump’s administration has announced that the defence spending will be increased and the nuclear weapons modernization will be perceived as an urgent priority. Currently, given the tense relations in Europe, it is absolutely crucial to demonstrate unity of the North Atlantic Alliance. NATO member states ought to consistently modernize their Armed Forces and increase defence spending to 2 percent of GDP, regardless of contemporary political issues. There is no doubt that Poland should support NATO’s nuclear sharing policy and discuss with the allies an opportunity of joining the program in the future.